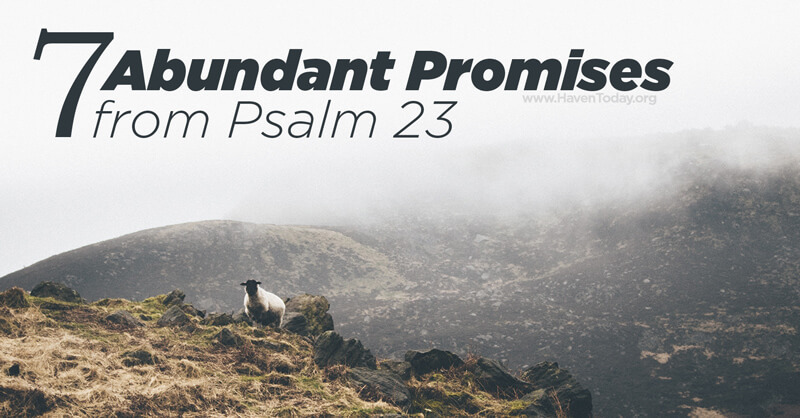 Psalm 23 may be one of the most famous passages in Scripture. You’ll often hear it recited in funerals and sometimes at weddings. You might even hear it used in your favorite TV show or movie. The point is, these six powerful verses of Scripture speak to us all—whether we’re in good health or turning the pages of life’s final chapter. I’m thinking of my elderly mom. Her eyes have dulled by macular degeneration, and her hearing has degenerated by the passing years. She knows her days are few. Tears coming as she reflects that life will soon be over. She was worried that no future awaits her. But Psalm 23 was what I shared with her last week to bring back hope that the Good Shepherd loves her as she prepares to enter His glory. I’m also thinking of a story told by the late Donald Grey Barnhouse at a famous church in Philadelphia. His wife had just died. He was left with a flock of young children and was having trouble meeting them in their grief. That day, those children received the comfort of this psalm with an illustration they would never forget. It’s a kind of comfort we all need as we face and pass through the door of death. But even if we’re not going through the shadow of death, Psalm 23 can still speak to our hearts. Through this psalm we can worship the Father who showed us kindness for Jesus’ sake. The first half is about the Lord, and we learn in the New Testament that it can be applied to Jesus. And in the second half, Jesus becomes our host and promises that we will live with Him forever. First, I shall not be in want. Left to ourselves, we lack everything that matters. Like sheep, apart from our shepherd, we are helpless. But when we belong to the one who is self-sufficient, inexhaustible, and utterly unchanged by time, we WILL lack nothing. He provides for us. Second, I shall not lack rest. The late Philip Keller, author of A Shepherd Looks at Psalm 23, pointed out how dangerous it is to be a sheep. Dangers that exemplify what humanity apart from Christ can face. Fear, friction, flies, and famine. But under the care of the Good Shepherd, none of these matter. Jesus leads us through life safely. More literally, He “rests” us in green pastures. He takes us from turbulent water to still water where He can give us living water to drink. Third, I shall not lack life. This is because Jesus promises to restore our souls. In Hebrew, the words “restores my soul” can mean “brings me to repentance” or even “conversion.” But since the word translated “soul” more literally means “life,” and since the picture here is of a shepherd leading his sheep … the words can also mean “He restores us to physical health” (not always in this life, but usually). And it also means salvation. Sometimes we are spiritually on our backs. We are helpless to help ourselves. Only Jesus can get us back on our feet, walking and living with Him. Fourth, I shall not lack guidance. “Jesus leads you in paths of righteousness for his name’s sake.” Jesus shows us the right way—a righteous way. Yet even as we stray from the path through sin, He leads us onto the right path to follow Him and live. Fifth, I shall not lack safety. Verse four speaks of the valley of the shadow of death and is often used to comfort the dying. Nothing wrong with that. But the verse also speaks even more to the shepherd’s ability to protect his sheep when danger comes. Wild animals lurk in the crevices of canyon walls. Sudden storms may sweep along the deep and dark ravines. In the same way, the Christian life is not always tranquil, nor is it always a mountaintop experience. And so we are never so conscious of the presence of the Lord as when we pass through life’s valleys. Sixth, I shall not lack provision. “He prepares the table before us. He anoints our heads with oil and our cup overflows.” If we allow God to lead us where He wills, we will find that a table is already prepared for us. Our heads will be covered with his joy and anointed with the purest oil. There He will serve us the wine of true joy. As the leader of the Haven Ministries, Charles Morris is always thinking of ways to lead Christians and non-Christians to Christ—hence the familiar slogan, “Telling the great story … it’s all about Jesus.” A former secular journalist, Charles has worked for United Press International, and as a press secretary for two former U.S. senators. He and his wife, Janet, have authored several books, including Missing Jesus. Charles’ latest book is Fleeing ISIS, Finding Jesus: The Real Story of God At Work. Most of the thoughts above are taken from broadcasts of Haven Today. Corum Hughes serves as the editor of this blog and coordinator for Haven’s social media content. A graduate of Moody Bible Institute, Corum lives in Boise, ID with his wife Molly. God speaks powerfully through the books of the Bible, and especially through the Psalms. This book of the Bible provides words to express your deepest thoughts and emotions to God. It can direct your worship and prayer, and draw you nearer to Jesus. “Psalms: A Reading Guide” is an insightful resource to help you dive deeper into the Psalms as you study God’s Word. Inside this conveniently sized pocket-guide, Charles Morris shares ways he has learned to uncover the treasures God offers to us within the Psalms. Thanks so much for the kind words, Anita. I’ll pass them on to Charles!